Tired of installing plugins and themes by opening FTP and uploading or you are unable to use FTP in office, then this extension is for you. OneClick Installer for WordPress Firefox Extension makes it easy for you to upload plugins and themes in a single click without opening FTP program. Anirudh made this extension, he made it as an extension to his plugin OneClick Install. 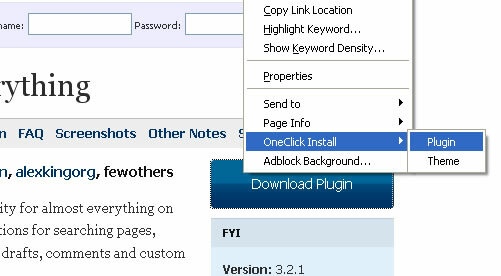 This plugin and Firefox extension installed you just right click on the plugin from the download page, a context menu will open with oneclick install option, click that and you are done. Now activate your plugin or theme from your dashboard. I have just started using this plugin, and have found it very useful. Thanks for sharing! That is really nice plugin.. I can save lot of time!